My timing in selling my position in Consciencefood has been unfortunate because a day after selling my shares the company announced that the CEO intents to take the company private: offering exiting shareholders $0.184 per share. So I guess that my concerns about the company were probably for a large part unfounded, but at the same time it also illustrates one of the bigger risks you face as a value investor. The value might have been there, but if the company can be bought at a 23.5% premium you still miss most of the upside, and everybody who didn’t buy recently gets a break-even result at best. Obviously it’s not a done deal yet, so it will be interesting to see how this is going to unfold. It wouldn’t surprise me if shareholders are happy to be able to exit a poorly performing investment at a small premium, but at the same time the offer price is below the recent IPO price which will make it tougher sell. I’m not a shareholder anymore, but in my opinion the CEO is trying to steal the company with a low-ball offer here. This entry was posted in General and tagged L1D.SI on September 30, 2013 by Alpha Vulture. High revenue growth, high return-on-equity before the IPO: good/lucky timing from management, or the results of manipulating the accounts? High capex after the IPO: (potential) growth, or a way to transfer cash to related parties? High debt position while having simultaneous a large cash position: why is the debt needed? Is the cash real? There aren’t a lot of other possible things to worry about as far as I can see. There is no acquisition activity, there is no goodwill on the balance sheet, their are no questionable loans on the balance sheet to suppliers or receivables from subsidiaries. Most of it seems pretty basic and straightforward. I think this is a really good question to ask because as a shady manager the prime time to commit accounting fraud is the period before an IPO. You want numbers to look good, and you want to get as much cash as possible from outside investors. And if you can spot fraud back then you know that you can’t trust the company today. One thing that had already attracted my attention is how receivables as a percentage of revenue and assets exploded in the pre-IPO period. The increase in the average trade receivables’ turnover days was mainly due to us granting longer credit terms due to the competitive nature of the instant noodles industry. In addition, we have decreased sales to our distributors and increased our sales to direct customers which tend to request for a longer credit period compared to sales through distributors. However, the average trade receivables’ turnover days during the periods under review were within our maximum credit period of 90 days. I have no idea who those customers are. I can’t find anything tangible on Google, and also tried looking at some Indonesian registries of businesses, but I either get zero results or tons of results because the name is very generic: odds are that there is a “Toko Indah” in your city even if you are living at the other side of the world. What’s behind the low overhead? There are more ways to make accounts look good, and the good numbers in the earlier years are a bit suspicious. Indofood is the biggest player in the market with a 72% share of the noodle market. 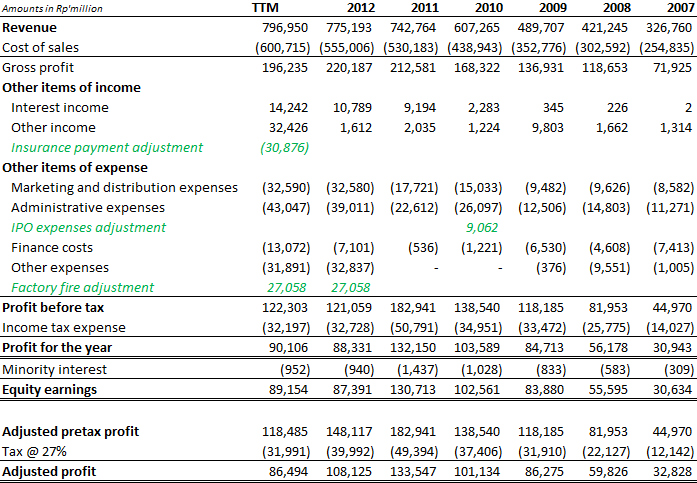 The company has similar gross margins as Consciencefood (around 26%), but as a percentage of revenue their spending on marketing, distribution and administrative expenses is a lot higher. 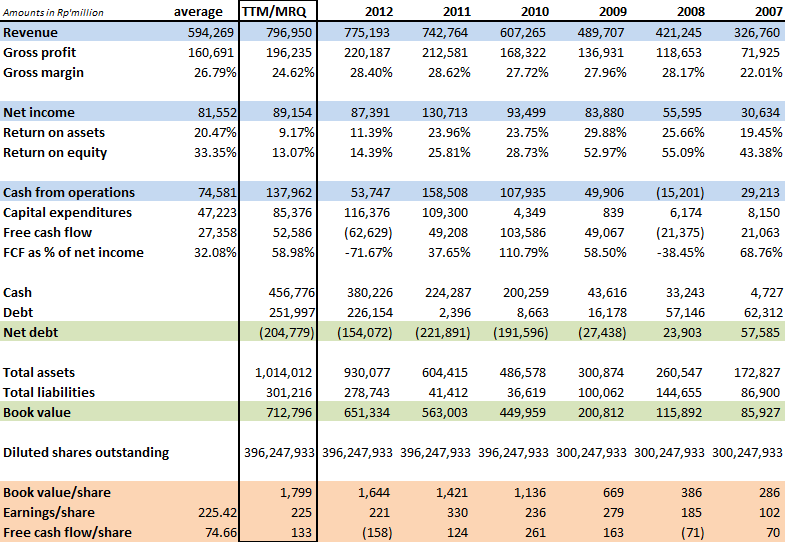 Consciencefood spent just an average of 5.5% of revenue between 2007 and 2009, while the average for 2010 to 2012 is 7.2% and climbing (TTM is at 9.5%). Part of the thesis was of course that this is just temporary because the company is trying to grow, but you have to wonder why a significantly bigger company spends on average between 13 and 14 percent of revenue on SG&A. I would have expected that a bigger company could enjoy some economics of scale if there would be any difference. A possible explanation is that SG&A costs were hidden through related party transactions, but that these costs are now coming back. How this could have worked is that Consciencefood sold their noodles through distributors (an undisclosed related party) that asked artificial low prices for transport and marketing. Now that the company is public these related parties get back their money by being able to ask higher prices. It sounds like a plausible scenario, but the big question is of course why Consciencefood is, even at these elevated levels, still spending just 9.5% of revenue on SG&A while Indofood has been spending significantly more every year. Maybe this hypothesis explains part of the increasing SG&A expenses, but it can never be a full explanation. The costs simply aren’t high enough after the IPO. There is one cost that should be similar for both companies: transportation. Getting things from A to B is a commodity business, and the cost of fuel and trucks are the same for both parties. So how much of their revenue is Consciencefood spending on transportation versus Indofood? Consciencefood doesn’t disclose this in their annual report, but between 2007 and 2009 it was approximately 1% of sales while Indofood spends 3% of sales on transportation. Indofood does a lot more things than making noodles. Their consumer branded products division generates 43% of sales and is good for 42% of EBIT. So it seems unlikely to me that the high transportation costs are the results of lower margin business divisions, and when we look at the segment results we see that the consumer branded products division does have SG&A expenses in line with the >13% average. 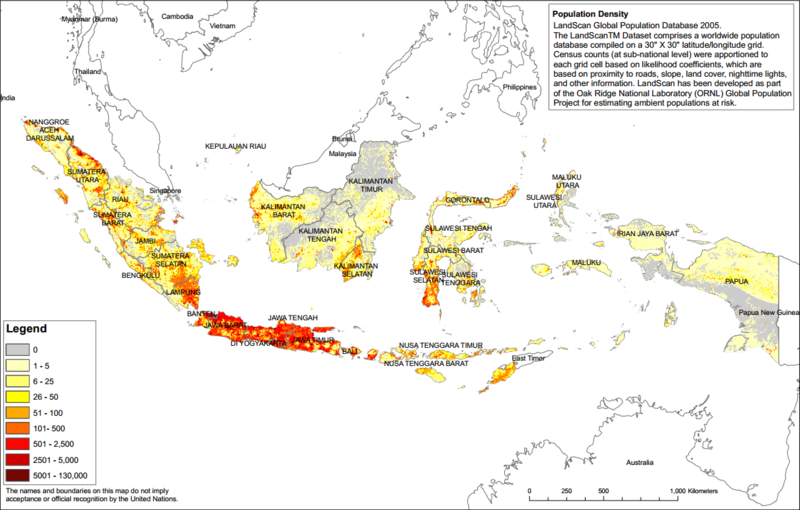 What’s also not helping the Consciencefood case is that North-Sumatra doesn’t have a very high population density compared to Java. This shouldn’t be positive for transportation costs, and the same is true for the fact that Consciencefood is pricing their noodles at a slightly lower price point than Indofood. If you move cargo that’s worth less you generate less revenue while you still need the same amount of fuel to move it from A to B. So what could explain the low transportation costs? With a lower population density it’s unlikely that they have to drive significantly smaller distances. Trucks and fuel are priced the same for both parties, and while I haven’t found a good data source it’s nearly impossible that different wage levels are the explanation. The minimum wage in North Sumatra is actually higher than in the Java provinces and so is GRP per capita. We deploy our own trucks to deliver goods from our factory to our customers that have been secured by our own marketing team. For sales made through our distributors, either Olagafood or our distributors will arrange for the delivery of goods by third party operators. We do not enter into long term transport contracts with third party transport operators as there are many such operators. The higher level of capital expenditures after the IPO could be a way to move cash from investors to insiders, but at the same time there is also a very valid and logical explanation available since the IPO was done to raise cash for expansion. But I still wonder what’s exactly going on. The company did almost 500 billion rupiah in revenue in 2009 with just 23 billion in PP&E while they did 800 billion in revenue the TTM with 280 billion in PP&E. Part of the explanation is that they have a large amount of unused assets related to their entry in the beverages market and that the Jakarta factory wasn’t running at full capacity, but still… why is there so much more PP&E required? Are they planning a huge expansion, or was the size of the business in the past maybe overstated? That would match with the low SG&A costs. What’s by the way interesting about their PP&E is the low amount of depreciation of motor vehicles in the years before the IPO. In 2009 depreciation for motor vehicles was just 264 million rupiah or ~20,000 USD. That’s extremely low for a company that at the time was supposedly producing 660 million packs of noodles and doing most of the related transport. You can read that they do their own transport when the noodles are sold through their own sales team in the quote a few paragraphs up, and in 2009 that was >70% of revenue. A positive is the factory fire in Jakarta. That might sound weird, but it’s a good check that their new equipment is in fact real. If write down 27 billion rupiah of equipment and inventory the insurance isn’t going to pay you 31 billion afterwards if it wasn’t real. And as a scheme to transfer cash from the balance sheet this obviously doesn’t work either. I think this is the item that got most people worried, but I don’t think it’s is a huge problem even though I have to admit that I can’t really provide an explanation of why the debt is used. The reason of why I don’t think there is a (big) problem here is because I do trust that auditors can do their job, and verifying that the cash is in the bank is one of the easiest things to do. A lot of investors got burned in China where they learned that cash doesn’t have to be real, but in those cases branches of the banks were in on the fraud. I’m not saying that this is impossible, but at the same time I don’t think it’s very probable. I still think that so far there isn’t a coherent story that explains how investors are being defrauded, but at the same time there are a bunch of questions that I can’t answer. I don’t think you have to know everything about a company when you invest – if that would even be possible – but when the answers to your questions are both potentially material to the investment, and potentially knowable for local investors I’m not comfortable with the unknown. Because of this I decided to sell my position in Consciencefood (my broker must be happy…). It was a though decision because I also see the potential for a lot of value here, but in the end I think it’s more important that I buy businesses that I can fully understand, and for now Consciencefood isn’t one of them. Sold the majority of my position in Consciencefood, and will sell the remainder soon. This entry was posted in Portfolio and tagged L1D.SI on September 26, 2013 by Alpha Vulture. Consciencefood Holding, a value growth stock? The Group’s gross profit decreased by Rp11,061 million or by 19.1% from Rp57,764 million in 2QFY12 to Rp46,703 million in 2QFY13 due to the higher raw material cost, labor cost, depreciation expenses and other production costs. The higher cost was also due to the fire that affected our warehousing operations at our Jakarta factory on 25 December 2012. The fire at the factory is obviously not a structural problem, but higher raw material costs are a problem if the company is unable to successfully pass through those costs to consumers. The outlook of raw material prices is not positive according to the company. They actually have prepaid a large amount of raw materials because lower fuel subsidies in the second half of the year are expected to have a negative price impact. Administrative expenses increased by 72.5% or by Rp16,399 million from Rp22,612 million in FY2011 to Rp39,011 million in FY2012, due to the increase in employee benefit expenses and other operating expenses since we commenced the operation of Jakarta factory in April 2012, and due to the recognition of idle capacity cost incurred in production cost of Rp5,100 million since we have not fully utilized of our production capacity, mainly in the Jakarta factory and cup noodles production line. Administration expenses increased by Rp1,607 million or by 32.1% from Rp5,013 million in 2QFY12 to Rp6,620 million in 2QFY13, due to the increase in salary expenses and the recorded of fixed overhead cost for unused production capacity of Jakarta factory which this cost was not recorded under operating expenses in 2QFY12. The investments in the beverages segment and the Jakarta factory also explain why free cash flow has been low recently, and this also introduces us to yet another probable reason why the stock isn’t liked. The company started paying out ~20% of net income after the IPO, but stopped paying a dividend in 2012. I have mixed feelings about this decision. Not paying out dividends when you have attractive growth opportunities and negative free cash flow makes sense, but not when you have a massive net cash position. They are probably going to need more working capital when the Jakarta factory is running at full capacity and when they have launched the beverages, but with this much cash on the balance sheet you should be able to do both. I also wonder why there is simultaneously a big debt and cash position. Consciencefood is run by Djoesianto Law who saw his stake diluted from 73.4 percent to 55.6 percent in the IPO. He didn’t sell any shares in the IPO though, and that’s positive in my opinion. It was not an event to cash out, but to raise cash for the business. He gets a salary between S$500,000 and S$750,000 so his stock is worth something between 40 and 65 times his yearly income at current market prices. His big stake in the business should align his interests to a reasonable amount with shareholders, but since Consciencefood has a limited history as a public company there is not a whole lot to go on to form an opinion. What’s curious is that consciencefood.com hasn’t been updated since 2011. Communications with shareholders doesn’t seem to have the highest priority and you have to go to sgx.com to find the latest news. Yet another reason why the company might be undervalued, although this is not directly a positive. How much is Consciencefood Holding worth? I don’t know, but at today’s prices you are paying a price for a mediocre and declining business while it’s probably at least an average business and potentially a great business. Together with a strong balance sheet I think that should provide a good margin of safety, and you are also not paying anything for the potential success of their entry in the beverages market. How that’s going to work out is of course a big question, but it’s good to see that in the past they were willing to exit from marginal segments. They tried selling snack noodles in previous years, but this didn’t generate any real money so they exited the business in 2011. Rating: On a scale from one to five I’m going to give this idea three stars. There are a lot of unknowns, but the most obvious problems seem temporary in nature to me, and if they can repeat their past success the potential upside is huge. The company was written up earlier this year at “the red corner”-blog (part 1, part 2). This entry was posted in Portfolio and tagged L1D.SI on September 16, 2013 by Alpha Vulture.